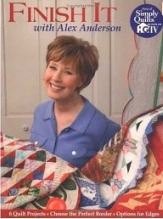 There are many quilt books, resources, and supplies for today's quilters. Whether a quilter uses the same traditional tools and techniques uses by quilters generations ago or new "cool tools" and modern methods, there is always a need for inspiration and helpful hints. 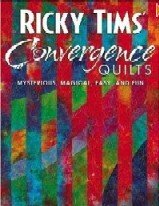 The following books are books I actually own, use and recommend for fellow quilters. For a list of the books used as references in the development of this website, refer to the bibliography. Patchwork and quilting have been an important part of our cultural heritage since the early American settlers arrived to piece together new lives from the resources close at hand. This colorful, picture-filled treasury introduces quilters, or more precisely, patchwork artists, to projects, block patterns, quilt patterns, and lessons. Of all the books in my personal collection, this one has the most bookmarks and sticky-notes. Shadows make quilts pop! An expert on creating the illusion of three-dimensions on a two-dimensional surface, Colleen Wise uses familiar techniques, such as color, value, piecing, and appliqué, to create all-new effects. Five projects and six design techniques let quilters easily create blocks and motifs that seem to float above the surface or recede into the background. Every quilter can be a quilt designer. Quilt design is not some mysterious art to be practiced by a select few. In 3 simple steps Wayne Kollinger teaches a step-by-step process to design unique quilts from traditional blocks. 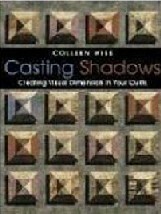 See design concepts in a new light and gain new confidence as you watch the author's quilts develop. An inspirational photo gallery throughout the book helps you visualize design concepts in a new light. Six quilt projects included. Finishing a quilt is a very different process than the piecing of one. The borders, bindings, and edges of a quilt have unique design considerations and applications. Miters, scallops, prairie points -- Alex takes the mystery out of these and many other concepts with simple instructions and lots of illustrations. Take your skills to the next level with the simple, step-by-step instructions in this book. Learn techniques to match triangle points perfectly, as well as painless diagonal piecing. Make a block any size using Alex's Magic Numbers. Construct a Sawtooth Star 3 different ways, including sew-and-flip squares. Then combine your skills with a bit of creativity and you'll be on your way to making stunning quilts! In her signature style, world-renowned artist and designer Laurel Burch uses simple fusible applique and embellishment techniques to present whimsical projects ranging from wall hangings to table runners, along with ideas for adapting changes for pillows and other home decor accents. 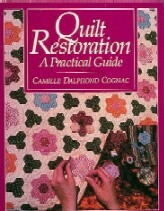 With this wonderful reference book's guidance, every damaged or recovered quilt becomes an exciting challenge. Individuals interested in repairing family quilts or researching repair techniques can learn how to distinguish a genuine historic find from an ordinary attic specimen, how to "steal" fabric from one part of a quilt to replace another, and how Victorian Crazy Quilts can be fixed by insetting embroidered patches without perforating the fragile silk. The excellent bibliography provides additional information for further exploration into this fascinating area of quilt history. 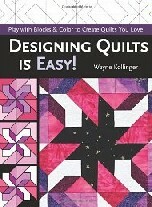 Beyer, one of the leading quilters in the US, has taught and written widely on the subject. In 1980 she issued Quilters Album of Blocks and Border, with 532 pieced block designs and 212 border designs. In this new volume, Beyer has expanded the collection to over 4,050 patterns. The book is a treasure trove for quilters, crafters, and artists. The author has arranged the patterns in a hierarchical manner. Blocks are divided by format (square, star, etc) and by design (four patch, nine patch, etc.). Square blocks are also divided by grids, ranging from a 2x2 inch to a 15x15 inch base grid (some are larger). The book provides a color sample of each block with its popular name and, if known, designer or source of first publication and date. The block's design is repeated in a black-and-white line drawing. Beyer has included gridded transparency sheets to help users see the underlying patterns. This makes the book more than just a checklist of blocks and doubly important to its users. Not only is it an album of ideas, it is a pattern book that can be copied. Additional features include quick references to popular patterns (leaves, flowers, etc.) and appendixes of block sources. This review was written by N.J. Quinlan of Nova Southeastern University for the February 2010 issue of Choice: Current Reviews for Academic Libraries, which is published by The Association of College and Research Libraries. There are many online sites with information about the heritage of quilting in America. Some are excellent, containing well-researched scholarly information, such as The International Quilt Study and Museum at the University of Nebraska - Lincoln. Others, such as Block Central's Quilt Directory contain links to many fine sites that pertain not only to the history of quilts, but to other elements of quilting as well.